Although it is still only November, I think we can all safely say that the festive season is fast approaching. Seasonal treats are appearing in our supermarkets, toy advertisements are taking over the TV. Santa is arriving in all of the shopping centres all across Melbourne. Excited children can't wait put in their Christmas present requests. Parents are equally as keen to purchase the annual Christmas photograph to use as gifts and Christmas cards for friends and family. 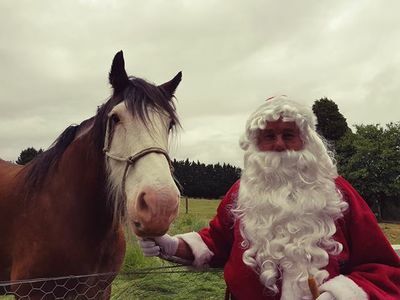 Drouin Santa Photos is a professional equestrian photography company that turn their premises into Santa's very own Lolly shop every Christmas. 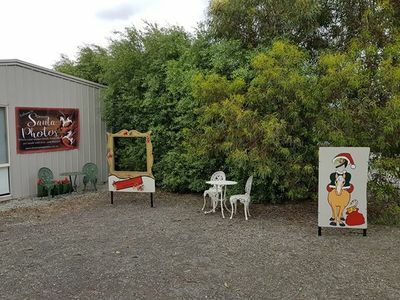 Based in Drouin in West Gippsland, it took us just under 1hr to drive from Melbourne's South East suburbs. Miss 3 was delighted to drive out to meet the "real Santa in his very own lolly shop" while we listened to Christmas songs in the car to fully get into the Christmas spirit. There was plenty of free parking and a ropped off pathway to provide safe access to the farm. There was a collection of Christmas cut outs dotted all around. And two beautiful friendly horses (Flossy and Solomon) who loved being fed carrots. Our daughter entered the traditional old fashioned Lolly Shop and saw the big man in red. Her jaw dropped in wonderment, her eyes became wide with excitement and her beaming smile of childhood innocence just melted my heart. Drouin Santa Photos not only created the magic of Christmas for Miss 3, they also took the most beautiful digital photograph for me to use on photos, mugs, key rings, mouse mat the list goes on and on. Make sure to book in early though as the "real" Santa only has limited availability before Christmas day. Book your children's Drouin Santa Photos in 2018 now. Sessions are available on Fridays, Saturdays & Sundays throughout the festive season. Book your session Here. It is $10 to book your Santa photo session online, and there are four different take-home photograph package. Photo package options from $45. 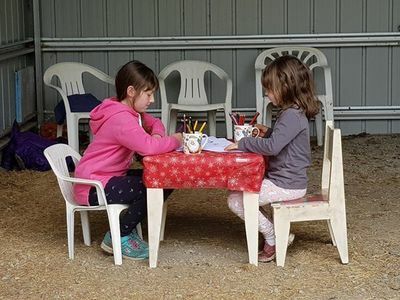 We are giving away two vouchers for you to book into a Drouin Santa shoot over the 2018 festive season. Gift certificates valued at $45 each and can be used towards a photo package of your choice. Vouchers are valid until 22 December 2018. If you would like to win one of two $45 vouchers for a 2018 Drouin Santa Photo Package, comment on this Facebook post. Ends 9pm AEST on Thursday 29 November, 2018. We will choose two winners at random. How can you tell If you are pregnant without a pregnancy test?